There are a few important things to know when you are working on training your dog that the vet is pretty dog-gone amazing. 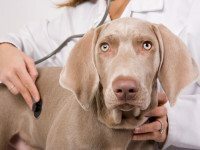 Many people see going to the veterinary clinic with their pet as a chore because Fido doesn’t behave well, Fido is too scared, or Fido becomes stressed. Well, that’s why we’re here to help. Below I’m going to give you the first few basic training tips and starters to getting Fido more comfortable at his vet office. It’s always best to start your dog out with these tips as a part of puppy training. If you have an older adult dog, work with a dog trainer for support and to guide you onto this path as well. Find a vet you LOVE-and make sure they’re willing to listen: The first step in training your dog to love the vet, is for you to love them first. This is the most important thing you could ever imagine. You want a vet that is willing to work with you, and if they’re not, they’re really just making their own job harder. Also, make sure they’re aware of your agenda before hand-give them a call and say “Hey, I’m going to work on my dog’s emotions towards the vet, I’d like you to be involved as well.” Not every dog enjoys going to the vet to get poked, prodded on, ears cleaned, teeth brushed, nails trimmed, etc. So it’s important you and your vet are on the same page. You always want a vet that will listen to you, find one just as concerned and willing to work just as much as you; you know your dog better than anyone else. And lastly, consult with a professional dog trainer during this process, you have to remember that not all veterinarians are trained in animal behavior, so let us all work together for the betterment of Fido. Always come prepared: ALWAYS, ALWAYS, AND I MEAN ALWAYS arm yourself with the yummiest treats Fido can have. Start out with something us dog trainers call ‘high priority’ meaning something that Fido won’t ever turn his nose to because it’s so delicious and he never gets things like this besides for special occasions. My treat of choice is usually the good ol’ chicken nugget or plain cheeseburger. Fido needs something to stimulate his senses and his tummy, a regular Cheerio or Milk Bone just won’t cut it. We always recommend saving higher priority treats for super special situations; grilled salmon, baked chicken, meatballs, etc. Start Simple: Not every visit to the vet has to be a real visit. Your first step in teaching your dog that it’s a fun place, is just to go and have fun. Call ahead and ask when a good time to stop by is and go have yourselves a little get together. Take Fido and your high priority treats, and just go say hi. If Fido is ready, have staff come out and great Fido, give him a treat and maybe a belly rub if Fido is willing, sniff around, and then Fido can go home. This teaches Fido that bad things don’t always have to happen here. With more and more social visits, Fido will be more relaxed each time he goes. Once Fido is becoming more relaxed, work your way up towards going into an exam room, eating some treats and getting visits, and then leave. Fido will begin to associate fun, treats, and positive socialization from the vet’s office through this process. Make it Fun: Fido will be so much more relaxed if you are too. The biggest fault people make when working with their dog is letting their own emotions get the best of them. Always accept your dog for who they are, don’t push them if they’re not ready, and train within Fido’s abilities. The biggest mistake is giving Fido expectations that are too high. It is absolutely impossible to perform such tasks two or three times and get frustrated as to why Fido still doesn’t love the vet; give Fido time to gain the confidence about his own emotions. When Fido goes into the vet and takes a treat, be super excited, give him more treats, clap your hands and jump for joy if you have to. You acting ridiculous will teach Fido that you can have fun here with him too. Dogs read into our emotions through our body language; stay relaxed and happy, if you feel yourself becoming stressed count to 10 and if that doesn’t work, just leave because nothing will come of it if you can’t relax yourself. Don’t soothe Fido’s fears: Most people will reassure their dog by petting them and telling them “It’s okay buddy, there, there.” What we want from you is reassurance and confidence. Of course we want you to emotionally support your dog, but when you are petting your dog during a time they are afraid, you’re rewarding them for their own fear. Tell Fido, “I’m here” and ask Fido for his best trick, like a sit or touch, something to redirect Fido’s mind and give him something he can succeed at. Then go crazy with excitement when Fido can do such task and give him at least three high priority treats to tell him how proud you are. Let Fido come out of his shell, if Fido is still too scared to go inside, start outside. Walk around the vet’s office, let Fido smell and experience all it has to offer without going in. Once Fido has done something fun, then you can leave. Always end on a fun note! Don’t be embarrassed: This is the most important virtue of professional dog training I’ve learned yet; stop being embarrassed about how your dog acts. Understand that everyone’s dog is different, your Fido isn’t your neighbor’s Buddy. All dogs deal with stress, fear, and anxiety differently. Your ultimate goal is to achieve something for Fido, of course it will make your life easier, but all of this is for Fido! I bet once you start seeing a change in Fido’s confidence, at the vet or anywhere else for that matter, you’re going to be glad you took the time to work with him, and all the people that thought you were crazy are going to wish they did the same thing. Once you see success, keep working and don’t stop. Once Fido learns the vet isn’t too shabby, sit back and relax and enjoy yourselves, and then go find something else you can help Fido work through. Eventually the hard work and training will pay off, Fido will be happier, and your job at the vet and other places just got a bit easier.